ECO-UV ink guarantees high density printing in a wide range of colours. The ink remains flexible after printing so that it does not crack when the printed material bends or stretches. ECO-UV is available in CMYK + white + gloss (clear) in 220 ml and 500 ml* cartridges. We recommend the use of an extraction system with these inks. ECO-UV produces beautiful results for indoor applications, such as labels, packaging and displays. You can also use this ink for outdoor applications. When used outdoors, the life span of the ink is two years if you use the clear ink as a finish. The prints dry instantly and can therefore be processed directly. The reason for this is that the LED lamps cure the ink immediately. You can print on an almost infinite group of media with ECO-UV ink. The LED lamps dry the ink droplets immediately after they land on the material, which means they are not absorbed and do not react with the media. And since no heat is used to dry the ink, printing on heat-sensitive materials is no problem. As a result, ECO-UV is compatible with shrink wrap, PE, PET, BOPP, self-adhesive PVC, paper, synthetic/natural leather and mesh. For prints that require good elasticity, you can call on ECO-UV S. Prints made with this ink can be stretched up to 220%, so they can even be applied to the most difficult and uneven shapes, corners and curves. Thanks to the high elasticity, the prints perfectly match the contours of PET bottles and plastic cups, for example. The ink is also ideal for vacuum-formed plastics used in food service trays, auto parts packaging and consumer electronics cases. The ink can also be used for three-dimensional large format prints, such as displays, signage and interior items. * Only available in the CMYK+White+White configuration. 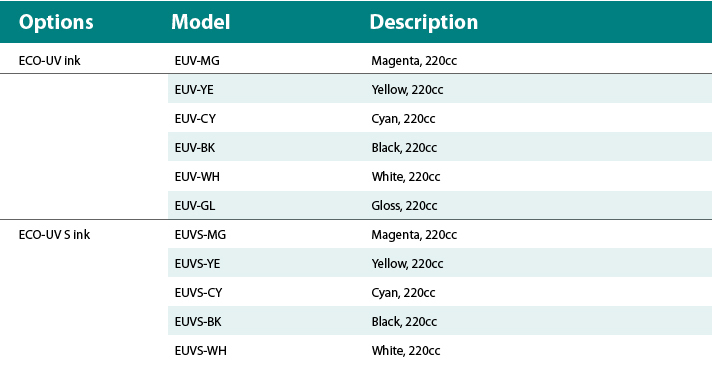 Users who use standard ECO-UV ink in the VersaUV can switch over to ECO-UV S.